Writing in The Times, Matthew Syed explains why allowing allowing a legal exemption for ritual slaughter rots the foundations of western civilisation. TV host Bill Maher’s controversial comments about Islam have sparked a petition to remove him as the December commencement speaker at the University of California, Berkeley. The Change.org petition, which had gathered nearly 2,000 signatures by Monday afternoon, was authored by Marium Navid, a senator with the student government group Associated Students of the University of California, with the support of Khwaja Ahmed, a member of the the campus advocacy group Middle Eastern, Muslim and South Asian Coalition, the campus’ Daily Californian reported Sunday. Reza Aslan: Media has pushed Islamophobia to ‘unprecedented levels’ in U.S. Religious scholar Reza Aslan ripped comedian Bill Maher on Monday, saying Maher had “gotten away” with making Islamophobic statements in the past because people like him – but adding that the tide has turned. “The problem is that anti-Muslim sentiment in this country is at unprecedented levels, thanks in great part to the media rhetoric,” Aslan said. 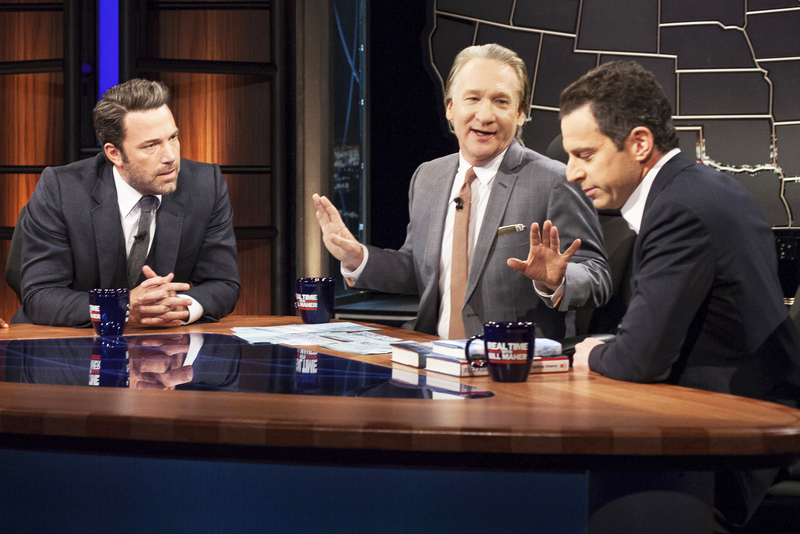 In a testy ten-minute exchange on “Real Time” with television host Bill Maher and author Sam Harris, Hollywood actor Ben Affleck slammed the host for commenting that Islam is the only religion that acts like the “mafia.” Along with journalist Nicholas Kristof, Affleck argued that ascribing an entire religion based on the actions of the terrorist group Islamic State, was “gross” and “racist,” while Maher and Harris shot back that criticizing Islam “gets conflated with bigotry towards Muslims as people,” a ploy that others have used to build on anti-Muslim sentiment in the country. To Maher’s idea of generalizing Islam, Affleck said, “It’s gross, it’s racist,” while Kristof added that the view of Muslims is “incomplete,” referring to the example of Malala Yousafzai, a teenager shot by fundamentalists, who is part of the larger peaceful Muslim movement. Harris panned both Affleck and Kristof’s responses saying that Islam is “the motherload of bad ideas” and that fundamentalists are not just the “fringe group” of practicing Muslims. Religious scholar Reza Aslan took some serious issue on CNN Monday night with Bill Maher‘s commentary about Islamic violence and oppression. Maher ended his show last Friday by going after liberals for being silent about the violence and oppression that goes on in Muslim nations. Aslan said on CNN that Maher’s arguments are just very unsophisticated. He said these “facile arguments” might sound good, but not all Muslim nations are the same. Aslan explained that female mutilation is an African problem, not a Muslim one, and there are Muslim-majority nations where women are treated better and there are even female leaders. Reykjavík’s two Progressive councilpersons showed up at a student party uninvited and held forth in an incident captured on video. Vísir reports that last Friday night, political science and economics students from the University of Iceland were holding a party at Hverfisgata 33. The upper floors of this building are home to a reception hall, as well as the offices of the Progressive Party. At some point in the evening, some of these Progressives decided to pay a visit. A student at the scene reported that the Progressives were having an event of their own on the floor below the student party. At about 20:30, Progressive MP Vigdís Hauksdóttir came upstairs uninvited to speak with the students. The student who spoke to Vísir described Vigdís as “rather intoxicated”, saying that the guests who followed behind her – also uninvited – “were not much better”. These other guests, also Progressives, included Gréta Björg Egilsdóttir, Jóna Björg Sætran, and Reykjavík city councilpersons Guðfinna Jóhanna Guðmundsdóttir and Sveinbjörg Birna Sveinbjörnsdóttir – perhaps best known to Grapevine readers as the city council candidate who ran on a platform primarily concerning opposition to a mosque in Reykjavík. She also told television viewers the night before election day that she was concerned Iceland would have a problem with forced marriages due to Muslim immigrants. “Isis recruitment moves on from online networks to British mosques.” Seriously, that’s the title of a report in the Guardian, of all newspapers. We know that right-wing tabloids have a disgraceful record of publishing inflammatory headlines about British Muslims that lack any factual basis, but you might have thought a progressive broadsheet which claims to uphold journalistic standards would feel obliged to come up with some solid evidence to justify such a damaging accusation. The Guardian article provides none. The springboard for the allegations that British mosques are being used to facilitate recruitment to a terrorist organisation is an interview with a 19-year-old ISIS supporter named Abdullah, who uses the Twitter handle JihadWitness. He is reported as saying that he “believed active recruitment was now taking place in mosques and other centres across Europe following Isis successes and their announcement that they had established a theological state, or caliphate (khilafah) spanning Syria and Iraq”. He asserts that ISIS is particularly interested in the UK where there is “a large minority of Salafis”. 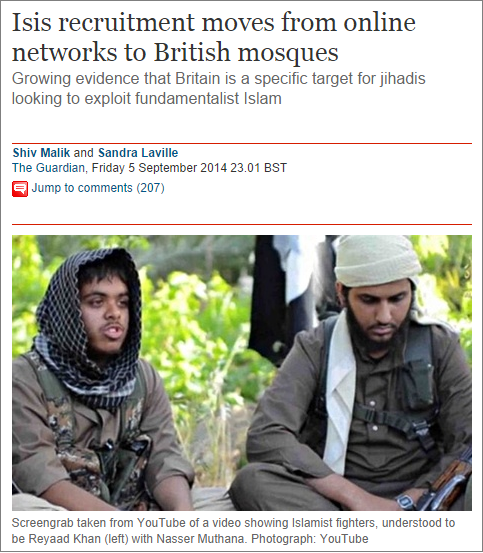 Evidently the Guardian thinks it’s appropriate to give credence to unsubstantiated claims about links between British mosques and terrorism, made by some obscure jihadi sympathiser whose Twitter feed consists of a stream of admiring comments about extremists around the world, from al-Shabab in Somalia to Abdullah el-Faisal in Jamaica. Did the Guardian‘s journalists make any effort to establish that “Abdullah” is in a position to give an informed account of ISIS’s recruitment techniques in the UK, rather than being just some deluded teenage fantasist? A London mosque has distanced itself from one of its former worshippers after she vowed to become the first female jihadi to kill a western prisoner in Syria. Khadijah Dare, from Lewisham in south-east London, said she wanted to carry out a copycat killing following the brutal murder of American journalist James Foley. Dare, who previously posted a picture of her toddler son posing with an AK47 rifle, is thought to have been a regular at the Lewisham Islamic Centre, which was allegedly linked to Michael Adebolajo, the killer of fusilier Lee Rigby. On Friday a spokesman for the centre said that, had Dare sought advice before travelling to Syria, it would have dissuaded her from “taking the particular action that she did despite us fully understanding why young men and women may be motivated to travel to Syria because of the tragic human suffering taking place there”. Since alternate MP for the Progressive Party Þorsteinn Magnússon’s resignation from the party last week, several other party members have followed suit and many other people have expressed their support. As reported, Þorsteinn resigned from the party due to the inaction of party leaders in regards to comments made by then city council candidate, and current city council member, Sveinbjörg Birna Sveinbjörnsdóttir, about the building of a mosque in Reykjavík. Þorsteinn had criticized Sveinbjörg’s conduct immediately following the initial comments in May. He resigned last week after several attempts to get the leadership of the party to condemn her actions, which he called “in no way appropriate for a civilized political party,” failed. Þorsteinn Magnússon resigned yesterday as Alternate MP for the Progressive Party citing the party’s handling of the mosque issue. Þorsteinn said in an interview with visir.is that the reaction of the party’s leadership implies that there was nothing wrong in the party’s handling of the matter. “The chair and most other key people in the leadership of the Progressive Party failed to publicly comment on the conduct of the party in Reykjavík during the election campaign period. Then the recent words of the chair of the party, in my view, imply the complete denial that anything was wrong … The party has in my opinion not handled the case in an acceptable way,” he commented. 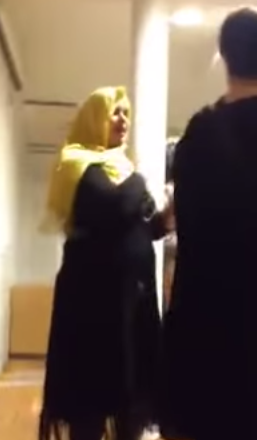 As reported earlier, the party’s leader in Reykjavík, Sveinbjörg Birna Sveinbjörnsdóttir, stated during the municipal election campaign that she wanted city authorities to go back on their promise to the Muslim Association of Iceland on a free lot to build a mosque in Reykjavík. During the campaign, the debate, such as on the Progressive Party’s Facebook page, quickly turned into general opposition towards Muslims and a mosque in Reykjavík, resulting in support for the party surging and achieving two seats on the city council. 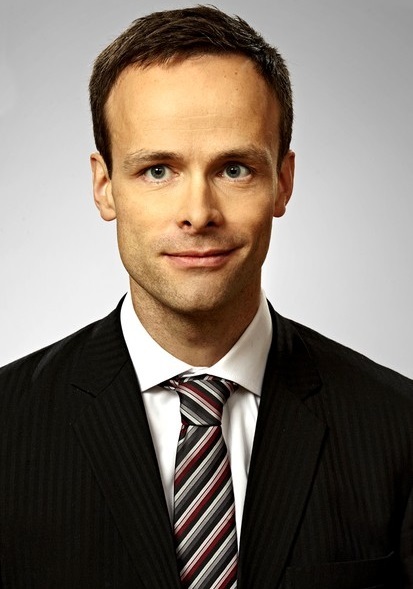 Prior to Sveinbjörg’s statements, polls had suggested that the party would not gain any seats in Reykjavík.